OTHER BABYLONIAN ACCOUNTS OF THE CREATION. Cuneiform accounts originally traditions.—Variations.—Account of Berosus.—Tablet from Cutha.—Translation.—Composite animals.—Eagle-headed men.—Seven brothers.—Destruction of men.—Seven wicked spirits.—War in heaven.—Variations of story.—Poetical account of Creation. have been a belief in the Creation and some of the leading features of this story long before these Creation legends were committed to writing, and there is evidence of other stories, related to those already given, which were at about the same time committed to writing. The story of the Creation transmitted through Berosus (see chapter iii. pp. 37–50) supplies us with a totally different story, differing entirely from the cuneiform account in the last chapter and from the Genesis account, and some fragments of tablets from Kouyunjik belonging to the library of Assurbanipal give a copy, mutilated as usual, of another version having many points of agreement with the account of Berosus. This legend, of which the following is a translation, is stated to be copied from a tablet at Cutha. Legend of Creation from Cutha tablet. 1. lord of . . . .
2. . . . . his lord the strength of the gods . . . .
3. . . . . his host . . . . host . . . .
4. lord of the upper region and the lower region lord of angels . . . .
8. on a tablet nothing was then written, and there were not left the carcasses and waste? 9. from the earth nothing arose and I had not come to it. 13. and in the earth the gods created for them a dwelling. 28. their seventh brother . . . . was his name. 1. . . . . evil . . . .
3. in . . . . I purified? 4. On a tablet the evil curse of man he carved? 6. seven in width and seven in depth I arranged them. 16. let . there not . . . .
18. and . . . . my iron may I take. 21. one of them did not return. 22. In the second year in the course of it, ninety thousand the same. 23. In the third year in the course of it, sixty thousand seven hundred the same. 25. I rejoiced, I made a rest. 27. at this time what is left? 29. and the ruler is not the preserver of his people. 1. . . . I caused to pursue . . . .
2. . . . . blood . . . . . . . . .
3. in the midst of them twelve men fled from me. 6. those men I turned . . . . .
7. Thus I said in my heart . . . . .
1. to . 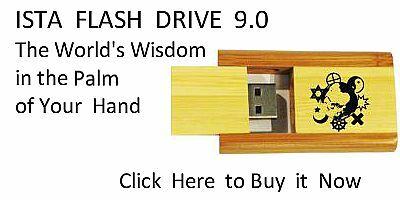 . . . .
2. the powerful king . . . .
3. the gods . . . .
20. and thy instruments, shall be multiplied. 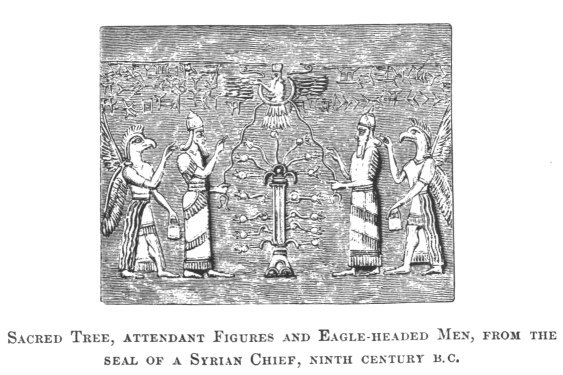 SACRED TREE, ATTENDANT FIGURES AND EAGLE-HEADED MEN, FROM THE SEAL OF A SYRIAN CHIEF, NINTH CENTURY B.C. agree with the composite monsters of Berosus, while the goddess of chaos, Tiamat, who is over them, is the same again as the Tiamat of the Creation legends and the Thalatth of Berosus. The relation in the second and third columns of the inscription is difficult, and does not correspond with any known incident. The fourth column contains an address to any future king who should read the inscription which was deposited in the temple of Nergal at Cutha. It is probable that this legend was supposed to be the work of one of the mythical kings of Chaldea, who describes the condition and history of the world before his time. There is another legend which appears to be connected with these, the legend of the seven evil spirits, which I have given in my former work, "Assyrian Discoveries," p. 398. Tablet with the story of the Seven Wicked Gods or Spirits. 5. devising with wicked heads . . .
6. ruling to the river . . . .
7. There were seven of them. The first was . . .
8. the second was a great animal . . . .
9. . . . . which any one . . . .
10. the third was a leopard . . . .
11. the fourth was a serpent . . . .
12. the fifth was a terrible . . . . which to . . . .
14. the seventh was the messenger of the evil wind which . . . . made. 25. descending to the abyss of waters, at first they came. 27. evil they set up, and an opponent they had not. 29. the account sank into his heart. 31. Sin (the moon), Shamas (the sun), and Ishtar (Venus) in the lower part of heaven to control it he appointed. 32. With Anu to the government of the whole of heaven he set them up. 41. they raised and in the government of heaven they fixed. 1. The god . . . . .
3. The god . . . . .
4. which . . . . .
5. In those days the seven of them . . . .
6. at the head in the control to . . . . .
7. evil . . . . .
8. for the drinking of his noble mouth . . . .
12. night and day fearing, in the seat of his dominion he did not sit. 16. from the midst of heaven like a wind to the earth they carne down. 22. to the god Hea in the ocean repeat." 24. to Hea in the ocean descended and went. 26. Nusku the message of his lord at once repeated. 28. his lips spake, and with wisdom his mouth was filled. 32. his trouble from heaven expel. 35. descend and sweep over the earth. 36. To the earth like a storm they come down. 38. the noble Shamas and Vul the warrior, to their side they turned and . . . . The end of this legend is lost; it probably recorded the interference of Merodach in favour of Sin, the moon god. In this story, which differs again from all the others, Bel is supposed to place in the heaven the Moon, Sun, and Venus, the representative of the stars. The details have no analogy with the other stories, and this can only be considered a poetical myth of the Creation. published in "Cuneiform Inscriptions," vol. iv. p. 15. The whole of this series concerns the wanderings of the god Merodach, who goes about the world seeking to remove curses and spells, and in every difficulty applying to his father Hea to learn how to combat the influence of the evil spirits, to whom all misfortunes were attributed.